FERREIRA PROJECTS_01 is proud to announce Deep Relaxation by Tom Milnes. Over the past five weeks he has created a sound installation by transforming the Gallery Studio into an ambient wonderland using culturally redundant audio material. Milnes is interested in cultures reliant on technology, cultures that only occur because of the invention/popularity of certain technologies. Deep Relaxation aims to turn the studio into an ambient wonderland. 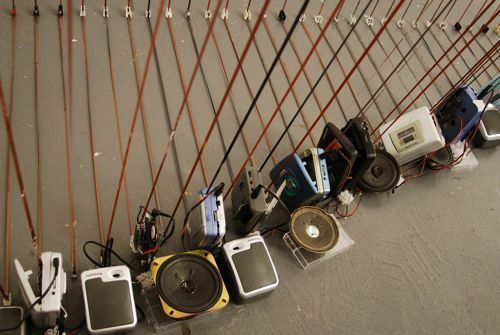 Using culturally redundant materials such as walkmans and New Age relaxation tapes, the space is draped with loops of audiotape stretching the width of the room. These loops are installed in situ, organised into patterns, winding their way up walls and over viewers' heads. Audio from the moving tape is played through speakers, layering the nature sounds together. The actual result is an un-ambient cacophony of various animal noises and New Age music, the work ironically is uneasy to relax in. With tape over head and sleeves under foot, the experience is aptly confusing mix of cultural references, being playfully New Age. Far from a spiritual experience, the piece may remind the viewer of technological advancements, cultural wastage and fads. Milnes has spent the residency collecting components and installing the loops into the studio. All the parts used in the installation are spares/redundant, this is not to say they don't work anymore, it is that they are not needed. Most of the machines function perfectly and where possible are untouched and as original as when first new. However, many âbroken' machines still have workable components and these are clearly used in the work. Unlike many sonic art projects where machines are stripped bare of their casing for an electronic lab aesthetic, Milnes feels this is all important to the content of the work and that it links the technology to a time, use and memory. Far from a museum display, the walkmans and tapes are actively performing as they were created to. Milnes studied at Oxford Brookes under the guidance of Artist/Musician Max Eastley. It was at college where Milnes started collecting machines and collaborating with scientists and musicians. Accumulating various detritus from the 20th Century, when consumer technology first appeared, his work soon became an investigation or map of technological advances and the work humans have created with these. Part of his work is purely to research these sub-cultures, with the Internet it is very easy to engage with enthusiasts/artists/collectors through forums and websites. FERREIRA PROJECTS_01 was developed as part of FERREIRA PROJECTS' ongoing goal to improve accessibility and participation by involving the viewer in the whole artistic process. It will allow the viewer the rare opportunity of seeing an artist conceive, research and develop their work before viewing the final outcomes at exhibition. The viewer will also be encouraged to engage in conversation with the artist about their work, through a number of different channels. The public programme, which may include artists' talks, workshops and gallery visits, are developed in conjunction with each individual artist during the residency period.